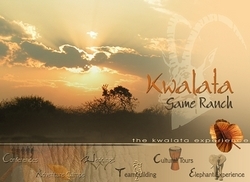 Kwalata is situated in the Dinokeng Big 5 Game Reserve, a Gauteng Blue IQ initiative, + 1 hour/100km north of O.R. Tambo International Airport. This owner managed Game Ranch has been in operation for 15 years and provides a true African experience in a malaria free area. Teambuilding programs are presented on low & high ropes by in-house facilitators. Shebeen and Township Tours to neighbouring Mandela Village. BACK UP GENERATOR INSTALLED TO ENSURE UNINTERUPTED POWER!